Diabetes mellitus is when not enough insulin is produced in the endocrine pancreas. So it's a health risk because without insulin, the body can't process sugars, fats and proteins properly. Not so sweet, right? Over the last 30 years the number of dogs diagnosed with diabetes mellitus has tripled. More common in middle-aged (yes, we know, it's all downhill from there) or older dogs and overweight females. Is your beautiful fury feline a little flabby? These cats are most at risk. Unlike dogs, male cats are more susceptible than females. For both your best-beloved pets your vet will have to be consulted until everything's stable (i.e. your stress-levels and their sugar-levels). 3. Increasingly thirst - drinking more water than usual. 4. Increased peeing - noticeably urinating more often. So, you've followed the clues correctly and your pet's being diagnosed - that's a round of applause due for you, right there. Your next task (and we know you'll accept it), is to take control of the treatment routine. 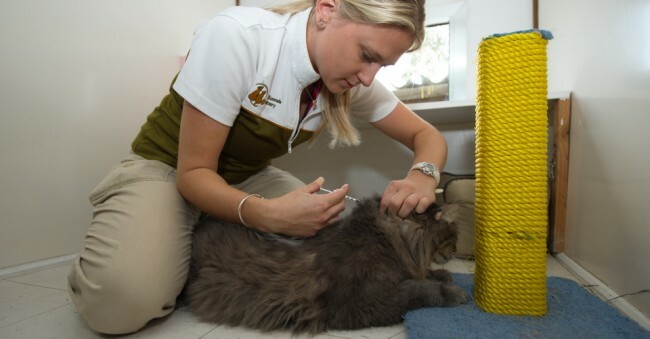 With diabetes, you'll probably need to give your pet insulin injections every day. Sounds hair-raisingly dire? Sure, you'll be knee-wobblingly-nervous at first, but after a few demos from your vet and a couple of practise runs, you'll think that childhood dream of being a vet wasn't such a bad idea after all. Your Ultimate Mission (now that you've aced all the others) is to keep glucose levels regular. Changes in appetite, gastrointestinal problems or fevers all can cause the blood sugars to go crazy, so keep your eye on the Ultimate Mission at all times, especially as diabetic animals need to be taken to the vet sooner than a normal (but sick) best-beloved. When you start off a change in insulin doses, you should be hyper-sensitive to signs of hypoglycaemia; this will manifest as weakness, staggering about like a drunken sailor or mental dullness... but a quick wipe of honey to the gums will return your best-beloved to a sober, alert pet again. Phew! Food: So, your new BFF (your vet) will help you out with what to feed, how much and when - the rest is up to you. A diet which is high-fibre and low-fat is usually recommended. One thing that you must never do is give insulin to your pet on an empty stomach. Dogs are generally fed every twelve hours (twice daily), usually together with their insulin shots. Diabetic cats are generally allowed to graze throughout the day, in keeping with the way they naturally feed. A piece of cake (yes, we went there!) once you get it right. Right? Water: Fresh and plentiful water at all times please. Dehydration is dangerous in diabetic pets as they won't be able to flush out any excess glucose. If you're concerned that your pet isn't drinking enough, check their gums and skin: If the gums look dry or if the skin doesn't "snap" into place when pinched, there's probably a problem with not enough fluid in the body and it's best to let the vet check them out... right away. The majority of dogs and cats diagnosed with diabetes are overweight yet despite all our delusions to the contrary, exercise is not the prime mover when it comes to losing weight - a good diet is. This said, it sure doesn't hurt, can positively contribute to weight-loss to some extent, and most importantly, getting fitter simply makes your pets (and us too, of course) feeling better in all sorts of ways. So, yes, exercise is critical if you want to get your pet back into good condition, which will contribute to keeping their glucose levels stable. Consistent exercise is better than random bouts of activity. Routine (particularly for your diabetic dog) is necessary to avoid sudden changes in energy (i.e. glucose) needs. With Fido, it's relatively easy to get him exercised. If you're already walking him once a day, make it twice and include throwing a ball or any other game that gets his four-legged motor running. But "How do I get my laid-back feline to exercise? ", we hear you wail. Well, playing with your cat will do wonders for energy levels and morale (for both of you!). Jumping toys on strings are usually a big hit, so start there and see how it goes. The more you play with your getting-healthier-by-the-day cat, the more you'll figure out what floats your tabby's exercise boat. Now that you have established Best Friends Forever status with your vet, keep in touch with regular visits - diabetes affects pets differently, as does their insulin, diet, exercise, etc. But stick at it, folks, because just as with us humans, it is absolutely possible to live a long and happy life as a diabetic, and once you get used to the whole routine you will once again find yourself back to a more normalised life... and you might even find yourself visiting your other friends (i.e. not your vet) again too.